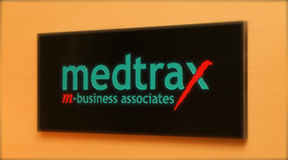 When we founded our company, we decided to call us as "medtrax". "med" basically stands for MEDIA as well as MEDICAL and MEDICINE. "medtrax" 's trax comes from the word, "track". We always track the new needs of our clients and track the most satisfactory solutions for them. The reason why we selected the letter "X" to make "trax" is that we would be always happy to accept unknown challenges for the bright future for our clients and for us.